Henry Repeating Arms (www.henryusa.com) offers a line of premium clothing items, including T-shirts, outerwear and caps, on their website. Like Henry firearms, all Henry Pride clothing is high quality, looks good and is "made in America or not made at all." As most readers have probably discovered over the years, promotional clothing from many manufacturers is basically cheap stuff, such as thin T-shirts and plastic ball caps made in Red China, that merely exploits the brand name. However, a few companies insist that clothing wearing their brand be long lasting, truly functional apparel. We found Henry Pride items to be in this latter category. The Henry Pride apparel sent to us and included in this brief survey includes an America's Pride T-shirt, U.S. Survival cap, Winter Cap, Hunter's Supreme coat and Stormy Kromer Mens Grey Woolover. Henry Hunter's Supreme Coat. Illustration courtesy of Henry Repeating Arms Co. The first item we unwrapped was the Henry Hunter's Supreme Coat (HHSC204). 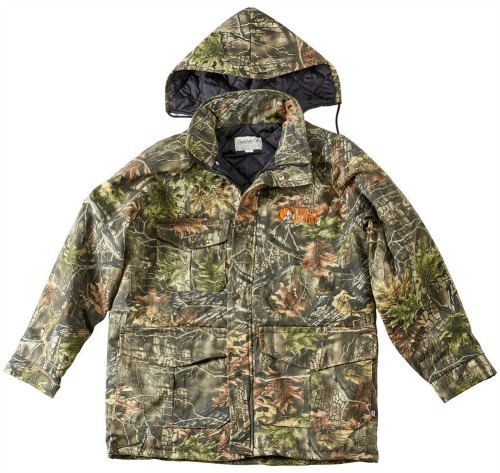 This 50% poly / 50% cotton jacket is made from a soft-handed Lynch "SuperFlauge Game" camo pattern outer fabric that is touted as being "quiet in the woods." The quilted lining has a six ounce 808 Holofil makeup that will keep you warm on even the coldest days. A husky zipper with an over the top storm flap secured by large snaps closes the front of the coat. The outer cuffs can be drawn tight with Velcro cloth straps and there is a draw cord on the inside, as well as inner knit cuffs, to help keep cold air currents out. The jacket has enough accommodations for necessary gear, sporting large front cargo and hand warmer pockets and a right front chest pocket. The Henry name and logo are discreetly embroidered (not silkscreened!) on the right chest area. A detachable, snap-on hood completes the coat; this can be stored in one of the cargo pockets when not needed. Made in the USA for Henry by Clarkfield, this jacket is machine washable, line dry. Sizing ranges from Medium to XXXLarge. This coat is comfortable to wear, good protection in chilly weather and is an excellent value at only $56.00. Stormy Kromer Mens Gray Woolover. Illustration courtesy of Henry Repeating Arms Co. The Henry Stormy Kromer Grey Men's Woolover (HSKWO) is a handcrafted, pullover, quarter zip jacket. It is constructed in a wool-blend fabric of 40% polyester, 35% acrylic and 25% wool. It has a firm weave and should provide lightweight warmth in nippy weather. There is a coil zip neck closure with convertible collar and distinctive side seams secured by durable stitching that add to the stylish look. 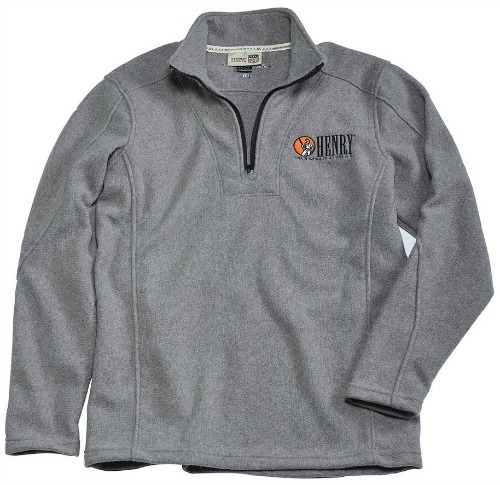 This is complimented by an embroidered Henry logo on the chest. Sizing ranges from Medium to XXXLarge. Machine wash cold, hang to dry. This deluxe slip-over jacket lists for $139.99. Henry America's Rifle T-Shirt. Illustration courtesy of Henry Repeating Arms Co.
Henry Pride includes a number of quality logo T-shirts. 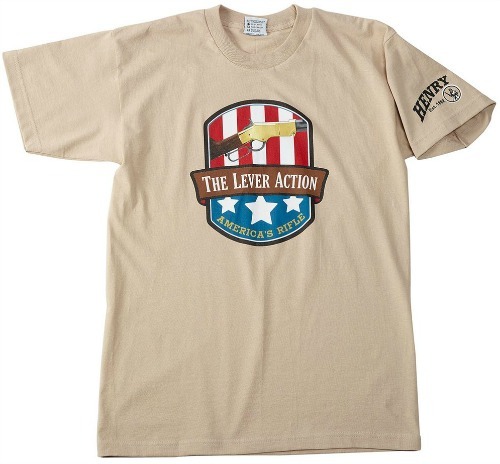 The one selected for this review is the "Henry America's Rifle" T-shirt (HTS016), which comes in sand color and sizes L to XXXL. This pre-shrunk, cotton/polyester blend shirt features full cut shoulder to shoulder taping with double needle sleeves and bottom hems. The red/white/blue lever action logo printed on the front features an original Henry brass receiver rifle and there is a Henry RAC logo printed on the right sleeve. The price for this deluxe T-shirt is $19.95, which seems to be the de facto standard for decent logo T-shirts these days. Turn the shirt inside out before you machine wash warm, rinse cold and machine dry. Henry Winter Caps. Illustration courtesy of Henry Repeating Arms Co. So as not to leave customers bareheaded, Henry includes caps in the Henry Pride collection, two of which we examined. A Winter Cap (HC014) in grey made of tightly knit Thinsulate and sporting an embroidered, orange and black Henry logo nicely compliments the Stormy Kromer pullover. This well made ski or watch cap type headwear sells for $16.95 and will keep your head and ears warm in the wintertime (if you pull it down). One size fits all adults. 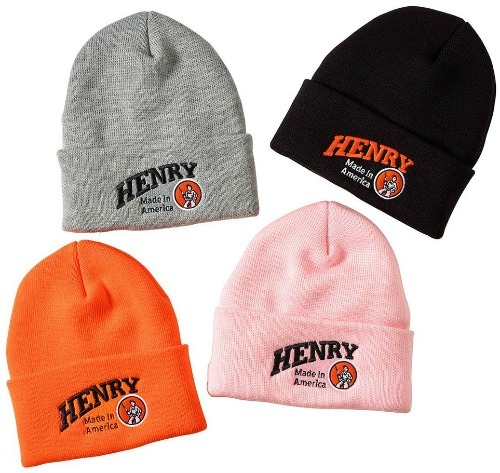 Winter caps are also available in black, hunter orange and pink, as shown in the picture above. Henry U.S. Survival Cap. Illustration courtesy of Henry Repeating Arms Co. The second cap is Henry's baseball style U.S. Survival cap (HC008). This is made of Mossy Oak camo breakup cloth and has a six panel, double-stitched fabric structure with an adjustable fabric back strap that fits medium to large head sizes. "U.S. 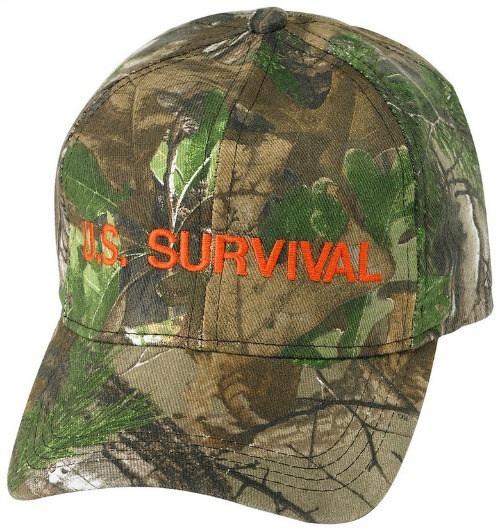 Survival" is embroidered on the front of the cap in honor of Henry's U.S. Survival AR-7 .22 LR rifle. This is a quality cap that should last for years, not a plastic promotional item. It sells for $19.95. These are just a sample of the items offered in the Henry Pride apparel line. You can order a free Henry print catalog, which comes with a complementary Henry decal, on the Henry website. Copyright 2017 by chuckhawks.com. All rights reserved.